If you require a pickup we know a company that can provide this service and can get a quote for you,email me your address & what you have to collect. 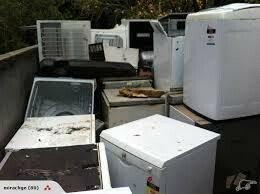 Drop off your old fridge,freezer,washing machine,dryer,waste disposal,range hoods,stoves,cooktops,wallovens,m­icrowaves,computers and monitors and any old scrap metal you dont require. **Pick up from your place starts at $55 incl recycle fee.